Not quite as large (or as expensive) as its Suburban cousin, Chevrolet’s truck-based 2016 Tahoe full-size sport ute nevertheless offers admirable cabin space, 7- to 9-passenger seating in 3 rows, 94.7 cubic feet of cargo capacity, and V8 power. On top of that, a sleek yet commanding profile and some nifty moves would seem to ensure the continued popularity of this family-oriented SUV. Look for the 2016 Tahoe trim iterations to remain the base LS, the quasi-posh LT, and the flagship LTZ, with all trims once again offered with standard rear-wheel drive (RWD), while on-demand 4-wheel drive (4WD) returns as an option for all trims. After a hefty reworking for the 2015 model year, the Tahoe offers only a few noteworthy changes for 2016. A couple of new exterior colors, Siren Red Tintcoat and Iridescent Pearl Tricoat, are expected to grace the upcoming Tahoe, while Chevy has apparently paid heed to customer complaints in offering a reconfigured gauge cluster for 2016. Additionally, the Driver Alert package that’s standard for the LTZ and remains optional in the LT, is slated to offer such extras as IntelliBeam headlights, a safety-alert seat, and a new lane-keeping assistance function that replaces the old lane-departure alert. Further alterations scheduled for next year’s Tahoe also include a cap-less fuel fill and a liftgate shield, while the once-ubiquitous CD player, as well as the handy SD-card slot, are both eliminated from the standard entertainment suite. Power for the 2016 Tahoe is again provided by a 355-hp 5.8-liter V8 engine that, when mated with the standard 6-speed shiftable automatic transmission, throws down 383 lb-ft of torque. Look for a maximum of 8,600 pounds of towing grunt with the proper equipment, while mileage should remain a tepid 16 mpg city/23 highway/18 combined in RWD variants, and 16/22/18 in 4WD versions. Oh, and 4WD configurations again include the competent 2-speed transfer case, while both RWD and 4WD iterations in LT and LTZ garb come with a standard rear locking differential that remains optional for the LS. Furthermore, an adaptive suspension is standard in the top-shelf LTZ and again available in the midlevel LT.
Appearance-wise, expect the lower-echelon 2016 Tahoe trims to sport, besides one of the 2 new exterior hues, 18-inch alloy wheels, a rear spoiler, a Class II tow hitch and wiring, step running boards, a roof rack, and heated power-adjustable mirrors. The LTZ, meantime, will doubtless remain offering 20-inch alloy wheels and reverse-tilt power mirrors, while both the LT and the LTZ are slated to return with the standard power-opening liftgate. Inside, this hefty Chevy, in its base LS configuration, is scheduled to return boasting premium cloth upholstery, power-adjustable front seats, and full power accessories, along with cruise control and tilt-wheel steering. Also, look for standard rear parking sensors and a rear-view camera to return in all 2016 Tahoe trims, along with tri-zone automatic climate control and Bluetooth-integrated OnStar telematics, once again complemented by last year’s debuting 4G LTE infotainment boost that includes an 8-inch touchscreen display. The LT and LTZ, meanwhile, are each expected to offer such standard add-ons as telescoping tilt-wheel steering, heated front seats, a remote garage door opener, power-adjustable pedals, and an auto-dimming rear-view mirror. Again, look for the LTZ to re-assert its upper-crust image with standard memory for driver’s settings and heated second-row captain’s chairs, as well as the upgraded Driver Alert Package, premium leather upholstery, and a heated steering wheel. With the expected deletion of the CD player and SD-card slot from the 2016 Tahoe, look for the LS to now carry an audio system boasting an AM/FM stereo with 6 speakers, satellite radio, and an auxiliary audio input. The LT, meantime, adds 3 additional speakers, while the LTZ is slated to carry a standard Bose premium audio package with 10 speakers. As for options, look for higher Tahoe trims to remain eligible for available upsized wheels, a power moonroof, and GPS navigation, while all trims are scheduled to remain in the running for the Max Trailering package that comes with a standard load-leveling suspension in the higher trims. Optional seating configurations, furthermore, should again include an available front bench seat in the LS for 9-passenger total capacity, while the LT can be ordered with an available second-row bench seat for 8-passenger capacity. Standard safety equipment for all 2016 Tahoe trims is expected to remain 4-wheel antilock brakes (ABS), traction and stability control, front side-mounted airbags, 3-row head curtain airbags, and GM’s unique front center-mounted airbag that offers front-seat passengers additional protection in side collisions (front bucket seats only). Further standard safety stuff aboard all trims includes daytime running lights, a post-collision safety system, OnStar emergency alerts and communications, and a remote antitheft alarm. The LT and LTZ also boast standard turn-signal-integrated mirrors, while the LT remains eligible for the enhanced-for-2016 Driver Alert package that’s standard in the LTZ. The National Highway Traffic Safety Administration (NHTSA), meantime, gives the current Tahoe its second-best 4 stars out of 5, overall, in various crash tests. Drivers complain that the 2015 Tahoe’s rear visibility is challenging, at best, while little seems to be accomplished for 2016 regarding current owner laments about its occasionally frustrating telematics and infotainment technology. On the positive side, owners laud the current Tahoe for its ride comfort and quietness, while, as mentioned, the slick profile continues to draw its traditional acclaim. Expect the value-conscious 2016 Tahoe to go on sale in the early fall of this year, when rivals will once again include Ford’s competent and techno-heavy Expedition and Toyota’s well-wrought Sequoia. 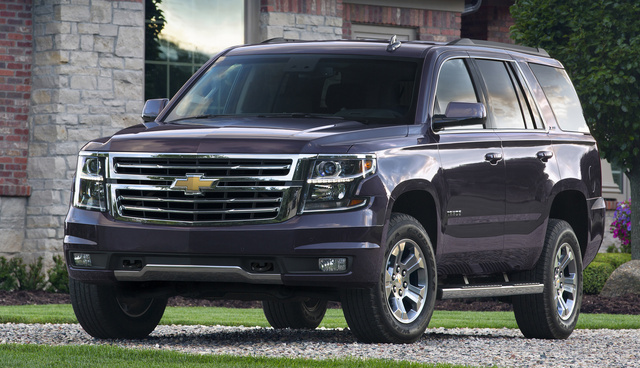 What's your take on the 2016 Chevrolet Tahoe? Users ranked 2016 Chevrolet Tahoe against other cars which they drove/owned. Each ranking was based on 9 categories. Here is the summary of top rankings. Have you driven a 2016 Chevrolet Tahoe? Contacting Seller - Still For Sale? I have tried using the feature to contact a Private Seller for a vehicle, but not gotten any type of response. How do I go about getting a contact number for them to discuss the vehicle? Will 20 inch Tahoe LTZ wheels fit 17 inch Tahoe LS wheels?